Jennifer Hanner, a first-year teacher from Harts, W.Va., center, holds a sign, outside the state Senate chambers at the Capitol in Charleston, West Virginia. Teachers statewide went on strike on February 22, 2018 over pay and benefits. Labor Day has come and gone. It is always a great day for celebrating the history and contributions of American workers and the achievements of the country’s labor unions. In the wake of the holiday, however, an assessment of labor’s fortunes and future is in order, especially in the context of ongoing legislative and legal attacks, as well as of the Trump administration’s rollbacks of worker rights and benefits. The list of setbacks is long. The current administration, for example, has cut funding for the National Labor Relations Board, further stymying this agency’s ability to protect labor rights under current law. It has issued an executive order making it easier to fire federal employees, by reducing the length of the appeals process. Obama-era rules to extend overtime pay to a larger number of workers have also been undone. Examples of legislative attacks include new state-level right-to-work laws (as shall be seen below, with mixed results) and red-state preemption laws in Arkansas and North Carolina designed to undermine pay equity provisions passed in progressive municipalities within these states. The most dramatic setbacks have been at the hands of the Supreme Court—with Neil Gorsuch’s appointment tipping the balance of the Court notably to the right. The first blow came in the form of the Court’s arbitration ruling. This ruling allows employers to require employees to sign arbitration agreements that give up the employees’ right to sue in court through either individual or class-action law suits. Critics have rightly labeled such agreements as the twenty-first century’s equivalent of a “yellow dog” contract, whereby employers once demanded that job seekers sign contracts stating that they would not join a union. Indeed, in the wake of the recent ruling, employers like Lowe’s have affirmed a company policy demanding that all managers and assistant managers enter binding arbitration agreements. Based on the ruling, Chipotle has already asked a court to exclude 2,814 workers from a wage theft lawsuit because they signed arbitration agreements. The undermining of an employee’s ability to participate in class action law suits is particularly concerning, as most workers hardly have the financial resources to seek legal redress on their own. Finally, there was the Janus decision. In an earlier Public i article, Ricky Baldwin offered extensive details on this case and on how it could potentially impact labor unions. Briefly, the Janus decision made it impossible for a public sector union to collect “fair share” fees from non-union employees in a bargaining unit. Given extant labor law, this means that unions must still represent and provide services to non-members, but can no longer require non-members to pay a fee for these services. The lure of becoming a “free rider” is presumed to appeal not only to those who previously declined union membership. It also holds appeal for many extant members who wonder why they should not jump ship too. After all, it is now possible to benefit from the union for free; and, further, they may feel doubly resentful at the prospect of carrying the burden of “free riders” when they pay full, possibly now increased by necessity, union dues. One recent study estimates that such dynamics could lead to a near-term loss of 726,000 union members nationwide. Fewer members mean a loss of union bargaining power. Long term, a 3.6% decline in overall public sector wages is predicted in the study and a 5.4% drop in public school teacher wages. How can unions and their allies fight back against Janus? One suggested remedy is for unions to become exclusionary in their service delivery, providing contract gains and grievance representation only to dues-paying members. To take this route would require some change in labor law—although the Janus decision does provide an opening for such change—but, more importantly, it is a strategy that could backfire. For one, it is a form of destroying solidarity by exacerbating tensions between co-workers at a worksite, an outcome that ultimately always works to management’s advantage. Worse, to the extent that vestiges of racism and sexism infiltrate the leadership and membership of unions themselves, in-groups and out-groups defined along racial and gender lines could be generated that parallel the member/non-member divide. A kind of feedback loop could operate, furthering a sense that unions promote and uphold discrimination. Legislative initiatives can be a more viable approach. At the state level, unions have worked with political allies to mitigate Janus’ impacts. One approach is to improve union access to bargaining unit employees. In California, a law was recently passed allowing public-sector unions to give presentations during new employee orientations. A second law restricts what governmental employers can say about the pros and cons of joining a union when they talk with their staff. In New York, Governor Cuomo, facing a challenge on the left from Cynthia Nixon, has signed a bill requiring all public agencies to provide unions with contact information for all new employees. The state also passed a law making it harder to opt out of paying dues, not least by letting unions define the terms for acceptable refusals. New Jersey has passed similar laws. But, ultimately, the best defense against Janus and other right-wing attacks on labor is a return to militant and aggressive grassroots organizing and retention approaches. Examples of the power of such approaches abound. Anticipating the Janus decision, IBEW Local 1245, an electrical workers’ local, organized and trained volunteer organizing committees in 34 public sector worksites. Since the program’s inception, 80% of workers at 25 sites have signed voluntary dues commitments; at 15 of these sites, 100% of workers have done so. 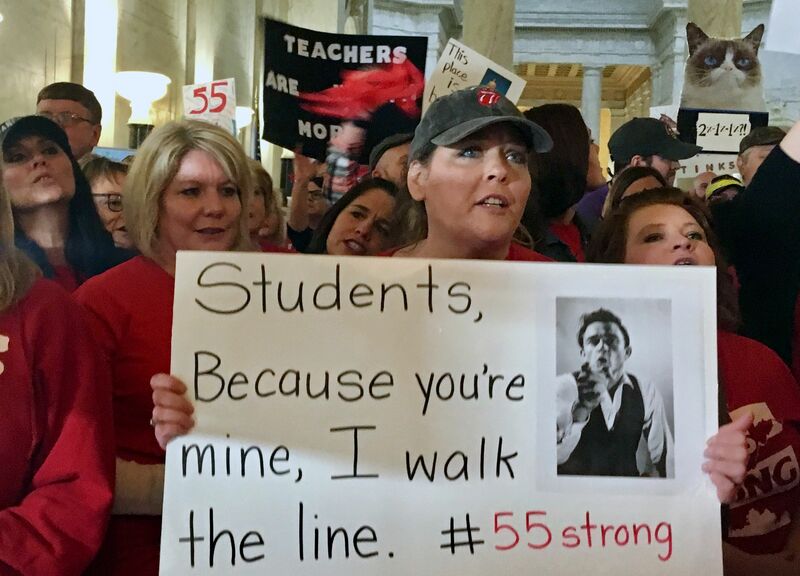 The recent wave of teachers’ strikes and mass protests offers additional examples of success and hope. In West Virginia, activists, many of them socialists, initially operated largely outside of normal union channels, because West Virginia Education Association and American Federation of Teachers-West Virginia leaders had for too long ignored grassroots mobilization. Restrictive state laws had conditioned them to rely almost exclusively on using donations and votes to court state politicians. The activists’ efforts to bring out the rank and file met with astounding success, and moved the two teachers’ unions to eventually call a statewide strike that lasted for over two weeks and won major wage and benefits concessions. Similar campaigns soon swept through Oklahoma, Colorado, Arizona, North Carolina and Kentucky, notably by and large red states. Finally, the rollback of a recently passed right-to-work law in Missouri is most heartening. In a state-wide referendum, Missourians voted to overturn a law that stipulated treatment of private-sector bargaining unit non-members in terms similar to Janus. The margin of victory was approximately three to one, implying that many non-union households voted against right to work. This victory was predicated on the innovative use of conventional and social media outlets, but perhaps most decisive was intensive door-to-door canvassing conducted by a coalition of workers, students, seniors and their families that reached over 800,000. In reality, mass mobilization of rank-and-file members and community allies is nothing new for labor. Nor is concerted action in the form of militant protest and resistance. Undoubtedly, the period of greatest gains for labor, in the 1930s, was of a piece with such approaches. It’s time to revisit the past to secure a better future.